Skimming across the water, the soft 'Skwim Disk' propels this new swim-sport! 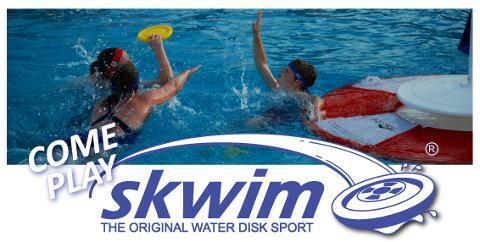 SKWIM ® is the "original water-disk sport" gaining popularity worldwide. Played in both shallow and deep water, SKWIM progresses with your ability, from an engaging learn-to-swim game to possibly the most electric, athletic, and entertaining water-sport of all time. If you're looking for a fun, fast-action water-sport for the whole family, SKWIM might be just right for you! Join the many thousands, ages 5 to 85, that have discovered SKWIM, and help bring this growing international sport to your pool-deck, dock or beach!. SKWIM is quick to learn, offering early and continued success, whether you're a beginner or advanced swimmer. If new to the water, "Shallow-Pool" SKWIM captivates with exciting disk-interaction and strategic play-making, while teaching you practical water safety skills. If you're an avid or competitive swimmer, "Deep-Water" and "Open-Water" SKWIM challenges you with explosive hydrodynamics and progressive disk-mastery. It's amazing to watch, therefore an engaging spectator sport! But you won't be in your seat long, as SKWIM invites you in to play! It's a great lifetime activity that helps build "water-safe, water-smart, water-strong community"! "Skwimmers" can advance their game well into their thirties and beyond. In SKWIM,quickness and speed can be overcome by disk-skill and game knowledge, adding value to older, seasoned players. 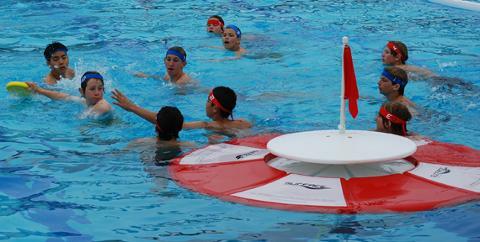 Experience in soccer, basketball, hockey, polo, and ultimate, all contribute to the like-strategies of this unique water-sport. SKWIM then adds the dimensional aspect of 360 degree scoring, and the defensive creativity to respond. The Skwim-Disk, made from XL Extralight ® , is soft and flexible for use in most all aquatic settings, and engineered to glide smoothly across the water. The Skwim-Fins comfortably and effectively enhance power and balance propulsion, freeing your hands to play the game. In association with SKWIM ® International www.skwiminternational.org ,SKWIM ® USA was founded in May 2009 to help unify SKWIM players, families, coaches, and officials from around the United States. Join SKWIM USA today and get regular updates on SKWIM lessons, teams, leagues, coaching, officiating, and Open-SKWIM times at your local pool. Sign ups for Spring 2011 SKWIM Teams are coming soon. Call your local pool and request SKWIM Team formation for 2011. For more information contact Kevin McCarthy, SKWIM USA Coaching Director at 425-869-6505; or email Kevin@skwimusa.org . We welcome quality coaches that want to make a positive difference in their youth community, and at the same time learn this fun new water-sport. If you are interested in learning how to coach SKWIM, please read the "coaching sections" included in the SKWIM™ "Quick-Start Guide", and the "LifeRing" philosophy of play; by clicking on the buttons here below! Then, contact SKWIM USA or SKWIM International by email atinfo@skwiminternational.org to find out how you can make a difference and help save lives in your community! If you’d like to play SKWIM™ in your town, but haven’t found us, please contact us today to arrange a complementary SKWIM™ demonstration at your local YMCA, Boys and Girls Club, municipal pool, or fitness club. No matter your age or ability, once you’ve played SKWIM™, you’ll understand why its the fastest growing water-sport in America. SKWIM 2012 about to begin! !